BROADVIEW AVENUE, a north-south street bordering Riverdale Park East, is a worthy destination for urban explorers. 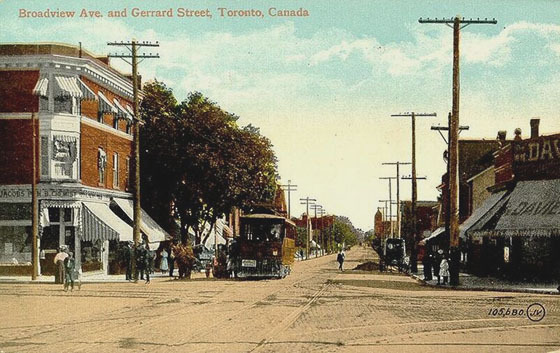 We begin at Gerrard and Broadview, the crossroads of Chinatown East (POSTCARD OPPOSITE); then comes the Old Don Jail, the National Presbyterian Museum; the repositioned and restored St. Matthew’s lawn bowling clubhouse; and the nearby statue of Dr. Sun Yat-Sen.
Neighbourhoods worth exploring on both sides of Broadview – restored worker’s cottages; a Don Valley/Brickworks lookoff at Chester Hill Road; the original Playter homestead (now being restored); the Playter Estate mansions; uphill and downdale Riverdale; and the restored Danforth Music hall, one of ten Allen theatres built following World War I. This entry was posted in Neighbourhoods and tagged Broadview Avenue, Canada, Toronto. Bookmark the permalink. As always, I am impressed with the best offerings from Toronto. I loved to walk along these streets in summer. Glad you shared. I never get tired of exploring Toronto’s inner city neighbourhoods. You just have to get out there and look around; it’s all free.